A record 8.06 million international overnight tourists arrived in Dubai during the first six months of 2017, according to Dubai’s Department of Tourism and Commerce Marketing (Dubai Tourism). This stellar 10.6 percent year-on-year increase underscores the expanding appeal of Dubai as a global tourism destination of choice. Almost all of Dubai’s top 20 inbound visitor source markets saw positive or near stable year-on-year performances in H1, 2017, with five of the top 10 delivering standout double-digit growth. India continued to top the list of traffic generators, crossing the one-million mark over a six-month period for the first time. Between January and June, 1,051,000 Indians visited the city, up 21 percent compared to the same period last year. Saudi Arabia and the UK retained their spots as the second and third largest feeder markets respectively, while arrivals from China and Russia rocketed. This was indicative of the strategic impetus of recent regulatory changes granting citizens from both countries free visa-on-arrival access to the UAE. Overnight tourists from Russia surged 97 percent during the first six months of 2017 compared to the same period in 2016. Generating 233,000 visitors, Russia cemented its return to the top 10 source markets. China ranked fifth, ending H1, 2017, with 413,000 visitors, up 55 percent year on year. With the exception of Oman, the remainder of the top 10 feeder markets all witnessed increased contributions during the period. The USA continued its resurgence to end mid-year up six percent in sixth place, followed by Pakistan, up 11 percent in seventh, Iran up 27 percent in eighth and Germany up 6 per cent in ninth. 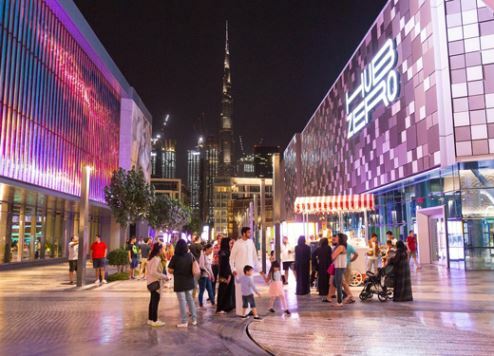 From a regional perspective, Western Europe contributed 21 percent of overnight visitor volumes, maintaining its pole position from earlier in the year, an achievement that reflects Dubai Tourism’s strong international destination marketing efforts aimed at driving traffic from a broader range of European markets. Dubai sustained its appeal among traditional stronghold markets across the GCC that collectively accounted for 19 percent of traffic during H1, 2017, the result of efforts to continually reinvent the city’s offerings to encourage repeat travel. North and South-East Asia, as well as the Russia, CIS and Eastern European bloc, both saw two percent gains over their 2016 year-end contributions to end H1, 2017, with 11 and 7 percent shares respectively. Dubai Tourism attributed this performance to a series of sustained cross-industry activities to raise general market awareness and tangibly grow visitor numbers via structured trade partnerships from these high-potential markets. South Asia, meanwhile, delivered a robust 18 percent share, making it the number three regional contributor, followed by the MENA region in fourth place with a stable 12 percent share. Rounding off the regional mix and reflecting the continued diversity of Dubai’s visitor base, the Americas contributed six percent in volumes, Africa 4 percent and Australasia the final two percent for the period from January to June 2017, all largely similar to 2016. “We are extremely pleased that Dubai has sustained the momentum of growth we achieved in the first quarter to deliver a strong double-digit performance through H1, 2017, setting the stage for continued acceleration in tourism volumes and GDP contribution this year,” says His Excellency Helal Saeed Almarri, director general, Dubai Tourism. The record H1, 2017, figures also take Dubai closer to achieving its Tourism Vision 2020 target of 20 million annual tourist arrivals by 2020. At the end of June, Dubai’s hotel room inventory stood at 104,138 spread across 676 establishments. This marks a five percent increase in the number of hotel rooms compared to the same time last year. Notably, despite the increase in supply, the average occupancy rate across all hotel and hotel apartment categories stood at 79 percent, rising 1 percentage point over the end of June 2016. Occupied room nights were also up year on year, totalling 14.53 million compared to 13.77 million at the end of H1, 2016, underscoring the continued success and attractiveness of Dubai’s diversified hospitality sector.